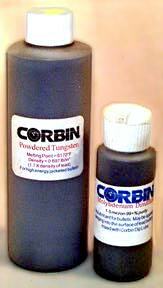 Corbin produces a number of unique chemical products for the shooter and bullet maker. Additional pages about specific products including MSDS sheets are linked to underlined words in the descriptions. MSDS (PDF format) Corbin Swage Lube (CSL) is a clean, semi-solid paste that can be applied with the fingers or a cloth pad to bullets, jacket material, lead wire, or cartridge cases. It washes off with hot water and soap, as well as most organic solvents, leaves no residue, is clear and pleasant to use, and is made of 100-percent natural ingredients of cosmetic grade, including highly refined lanolin and castor oil. 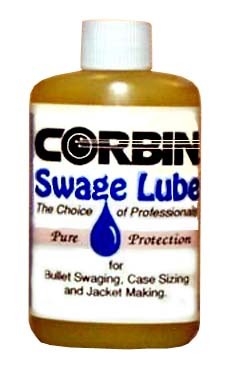 Corbin Swage Lube forms a tough film between the die and the part being formed, and withstands very high pressures without dieseling (unlike most common oil-based lubes, which detonate at swaging pressures). It is not a "bullet lube" for shooting down the bore: it is a forming lube that serves to protect the dies and tools, extend their life and prevent corrosion when they are not being used. 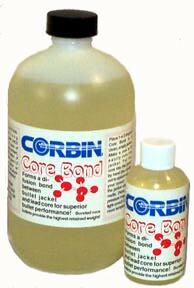 MSDS (PDF format) Corbin Core Bond is the "secret ingredient" behind 90% of the successful custom hunting bullets on the market today! It lowers the surface tension of lead and dissolves away oxides and carbonates on the surface of both lead and copper or brass, allowing the molten core to penetrate into the jacket material and form an inseparable bond. 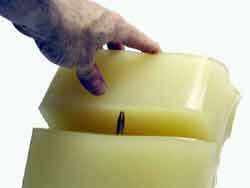 To use Core Bond, first swage the cores to weight and shape, and then drop them into the jackets. Place two drops of Core Bond in the jacket, and heat it with a torch until the lead melts. Let it cool. Boil in hot water with a tablespoon of baking soda (sodium bicarbonate) added per quart of water. Allow to dry. The core and jacket are permanently bonded, so the bullet could be turned inside out upon impact and still retain nearly 100 percent of its weight. New Formula! Activates by heat, low activitity at room temp means CCB can be shipped by air now! Available at last for export. For details on bonding, click here. MSDS (PDF format) Dip Lube (Liquid Jacket) is a synthetic wax liquid, which is applied by dipping the bullets into the polarized wax compound. Molecules attract to the metal and form a clear, thin layer of wax on the surface, protecting the bullet from oxidation, and helping to prevent fouling at speeds up to about 1400 fps. By adding molybdenum disulfide to the liquid, you can coat lead bullets with the black super lube and extend the velocity range into normal rifle speeds. 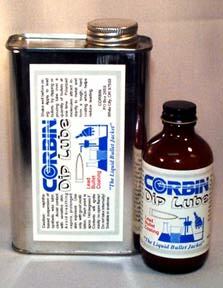 Corbin also sells high grade micron particle size moly lube (dry powder). Dip Lube works moderately as a swaging lube also, but is not as effective as Swage Lube at higher pressures. It can be used as a waterproofing agent for boots, a polish for both gun stocks and a water repellent finish for metal gun parts, as well as a bullet lubricant. It is a non-flammable, water-based solution. MSDS (PDF format) Corbin Bore Lap is used to polish and condition either a new barrel, to remove tool marks and burrs, or to repair a rusted or badly fouled older barrel by removing foreign matter. Unlike most abrasive lap compounds, Corbin's synthetic sapphire uses flat plates of about 30 to 40 micron diameter, which tend to pack tightly against the bore with their flat sides toward the rifling. Their edges then pry and cut off anything that projects from the surface, while the smooth sides slide along the surface and follow the rifling with far less wear than even some popular bore cleaners. To use it, apply to a cotton patch, wrap the patch around a 1-caliber undersized brass brush, and stroke one pass through the barrel by going two inches forward and pulling one inch back until the patch emerges. Molly Spray Lube is a dry-film bullet lubricant for lead bullets. It is applied from a pressurized spray can directly onto lead swaged bullets, allowed to dry 15-20 minutes before loading. MSL-11 leaves a dry, dark color film bonded to the surface of the lead bullet to help prevent fouling and leading of the barrel at moderate speeds appropriate for soft lead bullets. Contains molybdenum disulphide in aromatic carrier. Spray is highly flammable: do not use around open flames. Use only in well ventillated areas. Apply sparingly in a light spray: do not soak the bullets or allow to drip. 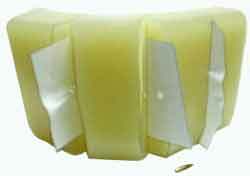 A thin film is more effective than a heavy build-up, which will be scraped off when the bullet is seated. One can provides sufficient coating for several thousand bullets when properly applied. MSDS (PDF format) Corbin Benchrest Bore Cleaner has been used by top shooters at Camp Perry and Wimbledon for over two decades. It is one of the "little known secrets" of the firearms trade, and is found in very few stores or retail outlets (only the very top specialty gun stores seem to know about it). It uses a mechanical prying action, of millions of tiny (15-20 micron) levers to lift and pry fouling of any composition from the bore. Since it does not rely on chemical reaction (the material is inert, with an oil base carrier), the type of fouling does not matter. Plastic, lead, copper, brass, even excess build-up of molybdenum disulfide from shooting too many "moly coated" bullets, can all be removed down to the steel barrel by stroking two inches forward, one back, until the patch and 1-caliber undersize brass brush around which the patch is wrapped emerge from the barrel (clean from breech if possible). 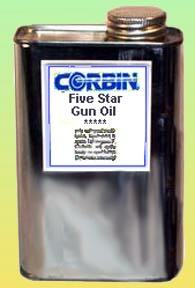 Then wipe the bore with Corbin Five-Star Gun Oil to wipe out the bore cleaner, and you have the cleanest possible barrel. metals NOTE: TUNGSTEN TEMPORARILY DISCONTINUED due to high market price. Both lighter and heavier than usual bullets can be made with various powdered metals. Certain combinations can be swaged and used without a jacket, as a solid. Corbin also offers electronically controlled heat treatment ovens for sintering and forming solids from swaged powders. For more specific information, check the powder metals page. Powder Atomized copper powder is available for experiments in lead free bullet making, and for production of frangible bullets. Corbin provides CUP-8 (8-oz or 3500 grain bottle), CUP-64 (4 lb or 28,000 grain bottle), and CUP-100 (100 pound drum) container sizes. The powder is micro-fine water atomized copper with 0.25% lithium stearate lubricant. It can be compressed to form copper bullets, mixed with other powder metals and binders, and used as the core of a jacketed fragmenting bullet.For more specific information, check the powder metals page. Prices are found on the PRICE LIST. Wire Pure lead wire is available in .100, .125, .185, .218, .247, .275, .312, .340, .365, .390, and .430 diameter. Take a 10% discount for purchasing four spools of a single diameter at the same time (packaged four to a carton). 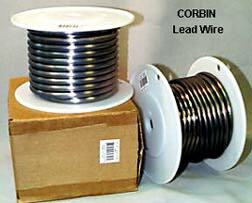 Corbin Lead Wire is wound on custom 6.5-inch diameter flanged spools with a 3.5-inch diameter core size (min. winding diameter) for kink-free, smooth feeding. The spindle hole is 0.75-inches, so you can mount the spools on a 1/2-inch to 3/4-inch pipe stand. Spool height is 4.25 inches, and weight for any size is 70,000 grains (11-pound gross shipping weight). For more specific information, check the lead bullet page. For prices, click Price List. Ballistic Media SIM-TEST is Simulated Animal Muscle Tissue Ballistic Test Media. It is a lab-grade bullet testing material, made of beef protein and other ingredients, that has a remarkable ability to simulate the performance of live animal tissue. It melts over boiling water and can be poured and cast into plastic or metal moulds or bread pans, and is stable at room temperature without having to be refrigerated. Use it over and over. May be cut with a piano wire stretched on a hacksaw frame. Available in 10 lb and 60 lb packages. For more info, see SIM-TEST page. 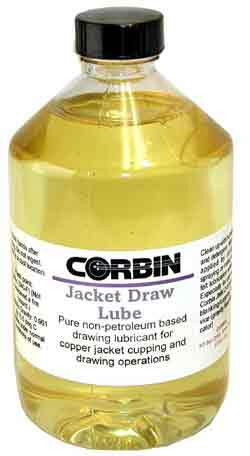 DRAW LUBE Corbin Jacket Draw Lube is used primarily in the JMK-2-H jacket drawing kit, in the automatic strip feed system (which has a roller lubrication system that coats both sides of the strip with a thin film of lube). It is a pure, non-petroleum, non-flammable lubricant in liquid form. It can be used for swaging and drawing operations as well, but is ideal for making bullet jackets from copper or brass alloys. Supplied in 16-ounce (pint) bottles.